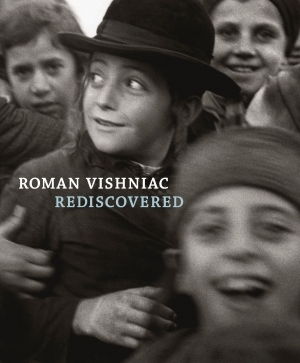 Roman Vishniac Rediscovered (International Center of Photography and DelMonico Books•Prestel), edited by Maya Benton, includes 475 images spanning six decades of the photographer's work, and essays by 23 world-renowned contributors. Drawn from ICP's vast holdings of work by Roman Vishniac (1897-1990), this generously illustrated and expansive volume offers a new and profound consideration of this key modernist photographer. In addition to featuring Vishniac's best-known work - the iconic images of Jewish life in eastern Europe before the Holocaust - this publication also introduces many previously unpublished photographs spanning more than six decades of Vishniac's work. These include newly discovered images of prewar Berlin, rare film footage from rural Jewish communities in Carpathian Ruthenia, documentation of postwar ruins and Displaced Persons camps, and vivid coverage of Jewish and immigrant life in America in the 1940s and '50s. Essays by 23 world-renowned scholars from a wide range of fields including photography, Jewish history and culture address these newfound images and consider them in the context of modernist tendencies in Berlin in the 1920s and '30s; the rise of Nazi power in Germany and eastern Europe; the uses of social documentary photography for relief organizations; the experiences of exile, displacement, and assimilation; and the impact of Vishniac's pioneering scientific research in color photomicroscopy in the 1950s and '60s. This first retrospective monograph on Roman Vishniac offers many new perspectives on the work and career of this important photographer, positioning him as one of the great modernists and social documentary photographers of the last century. Essays by Norman Barker, Maya Benton, Michael Berkowitz, Judith Cohen, Hasia Diner, Daniella Doron, Ute Eskildsen, Laura Hobson Faure, Atina Grossmann, J. Hoberman, Steven Hoelscher, Marion Kaplan, Barbara Kirshenblatt-Gimblett, Mara Vishniac Kohn, Yue Ma, Deborah Dash Moore, Avinoam Patt, Eddy Portnoy, Jeff Shandler, David Shneer, Herb Tam, Laura Wexler, and Bernadette van Woerkom.